Instructions for deleting or disabling your website. We'd hate to see you go, but if you are an administrator with full privileges on a website, you may request to delete your website permanently or disable it temporarily. To disable your website, you'll want to reach out to our customer success team at [email protected] for a link to do so. When you disable your website, no one will be able to access your website. 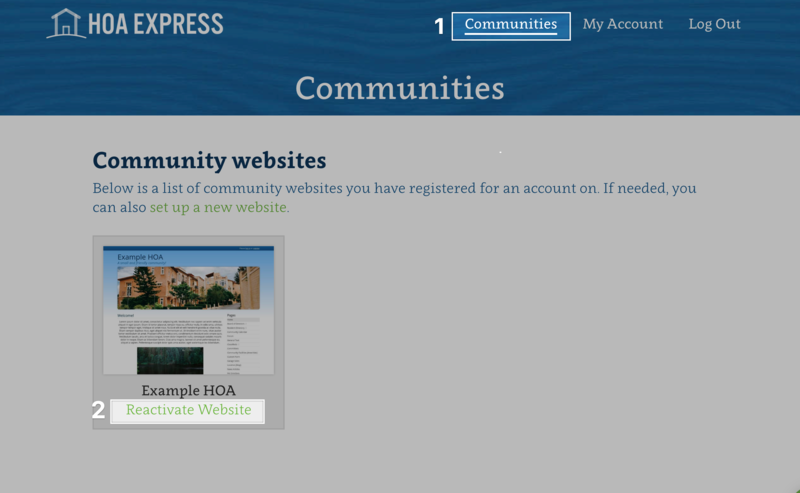 Since disabling your website is only temporary, you will be able to reactivate your website at any point by logging into your account on the main HOA Express website. Once you've logged into your user account, click on the "Communities" tab from the menu at the top and find your community website. Next, click on the green "Reactivate Website" link underneath it. This will bring up a screen where you'll want to confirm this action. To do so, click the green "Reactivate" button. If you decide to delete your website, you will need to contact our customer success team to receive a special link. When you delete your website, this will remove nearly all of the information from our system about your website and its content.